You can imprint in full-color on your custom acrylic awards, recognition products and paperweights using your Direct Jet printer. DCS has partnered with industry leader Artplak Studios to offer you blank laser cut acrylics in just about every shape you can imagine. To view some of the many shapes offered by Artplak you can view the Imagine Line at their website. Any shape seen there is available as a blank shape ready for your Direct Jet imprint. Blank acrylic shapes are available as small at 9 square inches (228.6mm) (example, 3" x 3" or 76.2mm x 76.2mm) up to 48 square inches (1219.2mm) (example, 6" x 8" or 152.4mm x 203.2mm) and in acrylic thickness options of 3/8", 1/2" or 3/4" (9.5mm, 12.7mm or 19mm). Blank acrylic shapes are also able to be laser cut in any custom size upon request. An upgrade to include an unassembled black acrylic base is also available for each acrylic size. 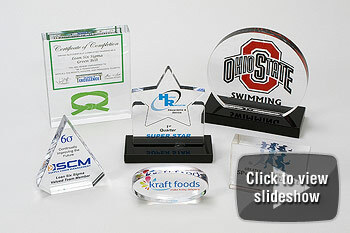 If you are looking for an award in a traditional shape such as a triangle, oval, rectangle or star, or in any custom cut you can imagine – from state outlines and sports equipment to animals and laser cut letters – related to your customers' industries and organizations, Artplak is able to provide the material you need. There is a 10 piece minimum order for the Imagine Line with a less-than-minimum charge available for smaller acrylic requests. 2" (50.8mm) thick block acrylic awards will be available soon. The AWE Line by Artplak also offers blank laser-cut acrylics, including personalized wine glass charms, cake toppers, holiday ornaments, seating place cards, table numbers and even unique event invitations. The acrylic thickness and size varies for these items from 1/8" (3.175mm) thick acrylic to 3/4" (19mm) thick acrylic, depending on the item you select. Images of the AWE Line can also be viewed on Artplak's website, and remember – any shape you do not see can be created. If you can imagine it, they can create it! Please visit www.artplak.com for a large selection of sample photos for inspiration. Quantity discounts are available. For more information, a custom quote or to place an order simply contact Artplak at (800) 848-4448 or info@artplak.com.